Now we have recharged our batteries over the Christmas break, it seems the ideal time to reflect on the great success of our training courses that took place during the Autumn term. 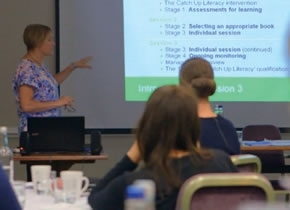 We delivered more than 50 ‘Delivering Catch Up®’ training courses (including an online course in Australia! ), welcoming over 700 attendees to the Catch Up® Community. In addition to this, we have been really pleased, once again, to deliver our popular Catch Up® information session webinars! Our Accredited Trainers received a very warm welcome at our Regional Training Centres during the Autumn term, as well as several schools and other venues across the UK. Our trainers travelled far and wide, with courses taking place in Bedfordshire, Merseyside, Bristol, Milton Keynes, Durham, Nottingham, South Yorkshire, London, Somerset, Reading, Manchester, Norfolk, South Wales, Essex, Telford, West Yorkshire, Birmingham, Eastleigh, Peterborough, Suffolk and many parts of Scotland! Across all of our courses, the average trainee response to ‘How would you rate the training course overall?’ was 4.6 (with 1 being ‘poor’ and 5 being ‘excellent’). We received extremely positive feedback, and some great suggestions of how we can make things even better! We really value the views of our Catch Up® Community as we know our aims are the same – to make a real difference for our struggling learners. The team are getting ready for another busy term, with courses planned right across the UK once again. There are spaces still available on courses this Spring; simply visit www.catchup.org to find out what’s coming up soon! We look forward to seeing you there and supporting even more struggling learners.